Not to brag, but just to point out Tales accuracy in recent predictions, Tales early on correctly predicted Scott Walker's victory in the recall election, Tales correctly predicted Ted Cruz win in the Texas GOP primary when Ted Cruz was way down in the polls, Tales also predicted that the Cruz win would be a blowout in double digits, Tales also predicted correctly that Mitt Romney would emerge as the Republican challenger to president Barack Obama, and also Tales predicted [I admit with a lot of hope in mind] that Mitt Romney would choose either Paul Ryan or Marco Rubio as his running mate. Tales, in order to be fair to the record, missed in predicting that Obamacare would be ruled unconstitutional in the Supreme Court. This has been the only blemish on the Tales record of predictions. With that in mind, here is Tales prediction of the electoral college distribution in the presidential 2012 election. I am really feeling good about Romney wins in Wisconsin and Iowa. Those will happen. I am confident about Romney wins in Ohio, New Hampshire and Colorado. The only state that I had second thoughts about giving Romney was Nevada because of the strong union force there, but I believe at the end, the union organization will be overridden by the people suffering from the extremely bad economy there. Nevadans just can't afford another four years of what they have gone through and I believe, in the end, a majority of Nevadans will vote for change by voting for Mitt Romney. While Pennsylvania, Michigan, and Minnesota are within the margin of error, and it is possible they could tip to Romney, I am being conservative in saying we will just fall a little bit short in all three states. 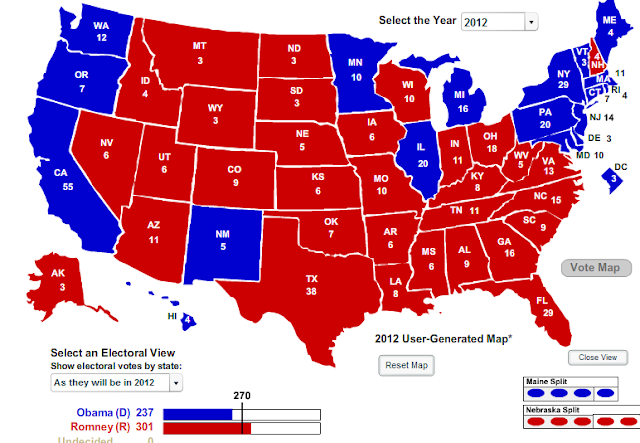 But never matter, Tales prediction puts Romney in command with a decisive win as he garners 301 electoral votes. This map also dispels the mantra being put out by the MSM that Romney can't win without Ohio. While I strongly believe Romney will win Ohio, even without it in this projection, Romney still wins 283-255. In fact, this electoral map shows Romney still has a legitimate way to win without either Ohio or Wisconsin [or without Michigan or Pennsylvania or Minnesota]. If, as Tales shows it, Romney wins Nevada, Iowa and New Hampshire [along with Colorado and of course Florida, North Carolina and Virginia], Romney still wins the presidency if he loses Ohio and Wisconsin 273-265. To go even further in this electoral prediction, Romney could lose Ohio, Wisconsin and New Hampshire and the race would end up tied 269-269. With the Republicans clearly winning a majority of states in the House of Representatives [where they would choose the president in a tie], Romney would still win the presidency in that scenario. So, all this talk by the mainstream media that Romney has few options to win the presidency [if he loses Ohio] while Barack Obama has an easier path, in the words of Joe Biden, "that is hogwash". It is actually the opposite. Barack Obama is the one who needs Ohio. Without it, he is toast. Looks good to me. I think he should get Michigan as well. 5days and the moving trucks can get the O's outta DC heading to Hawaii or to be king in some other country. Looks good to me also. I think he can get Pennsylvania and Minnesota too. That would be nice. I think we should send them back to, as mooch says, his home country of Kenya!! Michael, here is hoping you keep on being right in your predictions! Yep Krissy. I actually hope this prediction is wrong and Romney wins in an even bigger blowout!! If we can get MN this will be a complete wipeout. Hope your right. Thanks Peter! No one more than you knows how important this election is. God Bless!! I so regret that Oregon is blue, but at least the gap has closed somewhat!! I miss Texas and Lousiana at these times! Hope u are right about Ohio and Wisconsin!! Keep praying!